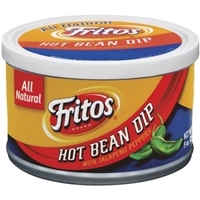 Water, pinto beans, vinegar, jalapeno peppers, corn oil, salt, maltodextrin (made from corn), dried onion, red pepper, sugar, chili pepper, dried garlic, and natural flavors. 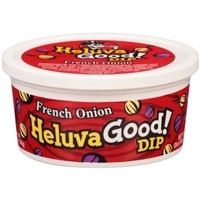 Brand/Manufacturer: Heluva Good! Hp Hood Llc. 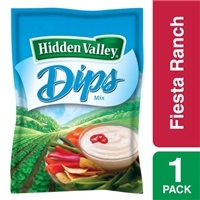 Cultured pasteurized milk, cream and nonfat milk, salt, dehydrated onion, modified corn starch, sugar, monosodium glutamate, parsley, spices, soybean oil, gelatin, potassium sorbate (to preserve freshness) and enzyme.contains: milk. 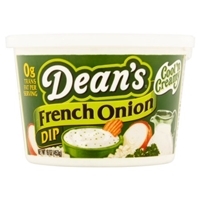 Brand/Manufacturer: Dean's Ventura Foods, LLC. 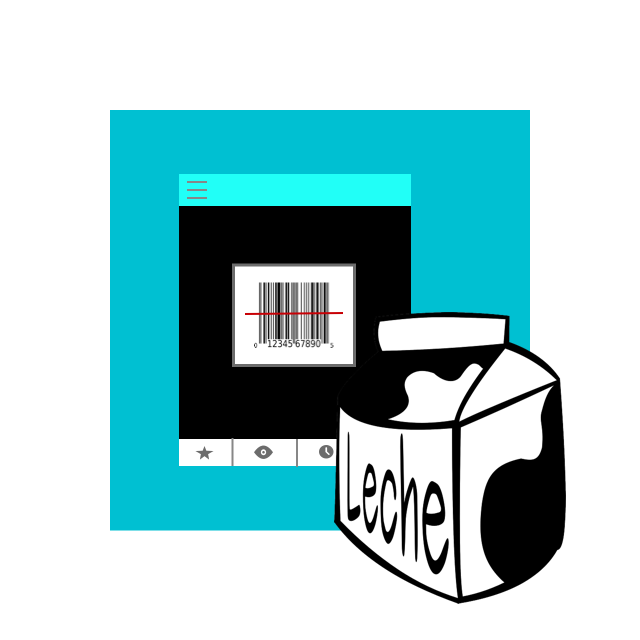 Skim milk, whey (milk), palm oil, water, contains less than 2% of onion (dehydrated), parsley (dehydrated), salt, sugar, hydrolyzed soy and corn protein, hydrolyzed torula and brewer's yeast protein, citric acid, lactic acid, acetic acid, monosodium glutamate, food starch-modified, gelatin, sodium hexametaphosphate, locust bean gum, soy lecithin, potassium sorbate (to preserve freshness), guar gum, carrageenan, yellow 5 & 6.contains: milk, soy. 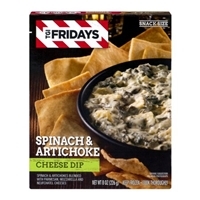 Water, spinach, artichoke hearts (artichokes, water, salt, citric acid, ascorbic acid), low moisture part-skim mozzarella cheese (milk, non-fat milk, cultures, salt, enzymes), parmesan cheese (part skim cultured milk, salt, enzymes), neufchatel cheese (milk and cream, cheese culture, salt, stabilizers [carob bean, guar, and/or xanthan gum]), cheese powder (whey, sunflower oil, maltodextrin, parmesan cheese [part-skim milk, cheese culture, salt, enzymes], salt, enzyme modified romano cheese [romano cheese (cow's milk, cultures, salt, enzymes), water, salt], contains less than 2% of yeast extract, citric acid, lactic acid, sodium phosphate), contains 2% or less of: cream powder, modified corn starch, enriched wheat flour, salt, garlic powder, sodium caseinate, maltodextrin, modified cellulose gum, mono & diglycerides, flavor enhancer (disodium inosinate & disodium guanylate), natural flavors, spice, annatto.contains milk, wheat. 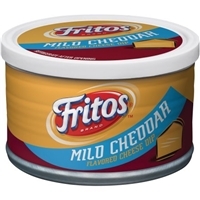 Water, skim milk, canola oil, modified corn starch, cheddar cheese (milk, cheese cultures, salt, enzymes), maltodextrin [made from corn], and less than 2% of the following: natural flavors, cream, pasteurized milk, salt, cheddar cheese (cultured pasteurized milk, salt, enzymes), butter fat, annatto, disodium phosphate, sodium citrate, yeast extract, cellulose gum, monosodium glutamate, acetic acid, datem, citric acid, lactic acid, and spice.contains milk ingredients. 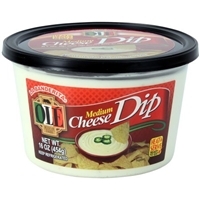 Salt, tomato, monosodium glutamate, maltodextrin, natural and artificial flavors, red bell peppers, spices, onion, corn flour, calcium sterate, carrageenan, paprika, dextrose, sugar, milk, buttermilk, disodium inosinate and disodium guanylate, cheese, modified food starch, acetic acid, citric acid, lactic acid, garlic, and sulfiting agents. 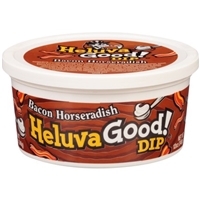 Cultured pasteurized milk, cream & nonfat milk, bacon and horseradish seasoning [salt, dehydrated horseradish, sugar, bacon bits (cured with: water, salt, sodium phosphate, sodium nitrate, smoke flavoring, sodium erythorbate, brown sugar, sodium ascorbate, potassium chloride, dextrose), torula yeast, monosodium glutamate, hydrolyzed corn gluten, dehydrated onion, modified corn starch, natural flavors, spice, disodium inosinate and disodium guanylate, maltodextrin, caramel color, yeast extract], modified corn starch, gelatin, potassium sorbate (to preserve freshness) and enzyme.contains: milk. 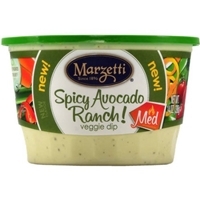 MARZETTI® RANCH! 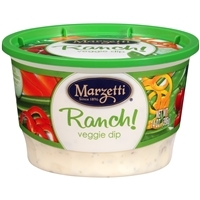 VEGGIE DIP. SINCE 1896. 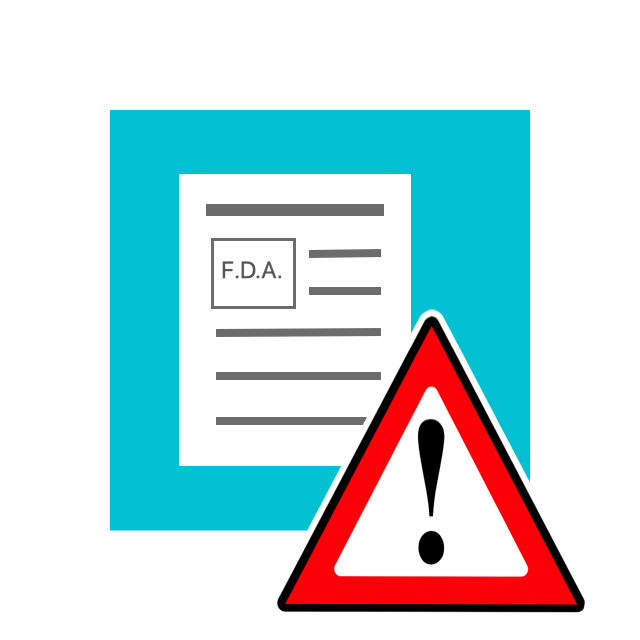 Sour cream (cream, modified corn starch, lactic acid, dextrose, gelatin, mono and di-glycerides, sodium phosphate, locust bean gum and/or xanthan gum and/or guar gum, acetic acid, citric acid, phosphoric acid, natural and artificial flavor), soybean oil, water, distilled vinegar, sugar, enzyme modified egg yolk, salt, monosodium glutamate, modified corn starch, onion*, bell pepper*, carrots*, potassium sorbate and sodium benzoate added as preservatives, natural flavor, garlic*, parsley*, xanthan gum, calcium disodium edta added to protect flavor. *dehydrated. 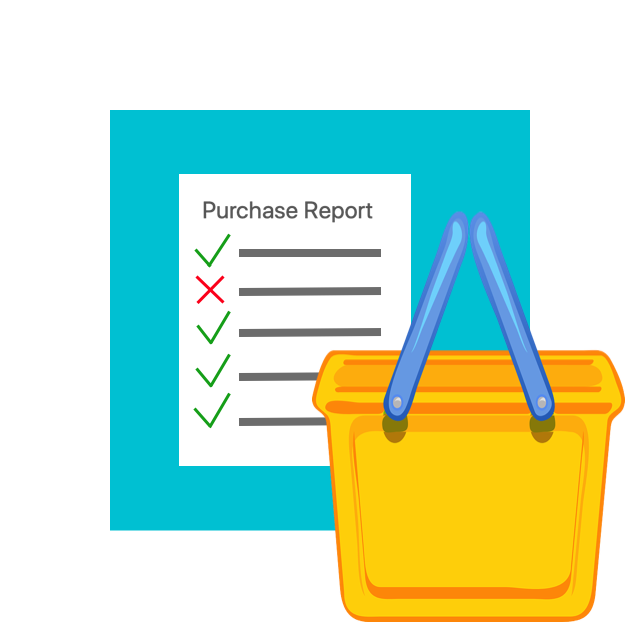 Soybean oil, water, avocado, sour cream (cream, modified corn starch, lactic acid, dextrose, gelatin, mono and diglycerides, sodium phosphate, locust bean gum and/or xanthan gum and/or guar gum, acetic acid, citric acid, phosphoric acid, natural and artificial flavor), distilled vinegar, egg yolk, salt, cilantro, garlic*, onion*, jalapeno pepper*, xanthan gum, cultured whey, lime juice concentrate, natural flavor, potassium sorbate and sodium benzoate added as preservatives, fruit juice concentrate added for color, spice, oleoresin turmeric, calcium disodium edta added to protect flavor. *dehydrated. ORGANIC VEGGIE PUREE (WATER, RED POTATOES, RED BELL PEPPERS, CARROTS, ONIONS, GARLIC), ORGANIC CASHEWS, ORGANIC SUNFLOWER OIL AND/OR ORGANIC SAFFLOWER OIL, SEA SALT, ORGANIC LEMON, ORGANIC CHIA SEEDS, ORGANIC PEPPER BLEND (CHIPOTLE, BIRDS EYE, CAYENNE, CHILI FLAKES), CITRIC ACID, ORGANIC PAPRIKA, ORGANIC MUSTARD SEED, ORGANIC BLACK PEPPER, ORGANIC OREGANO. 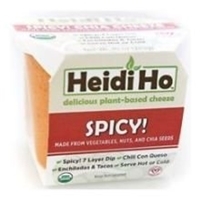 American cheese (pasteurized milk, salt, cheese cultures, enzymes), water, jalapeno peppers, skim milk, carrots, onions, spices, sorbic acid (to protect flavor).